Roots Synthetic Lubricating Oil ISO-VG-150 - 1 Quart, Tri-State Wastewater Equipment International, LLC. 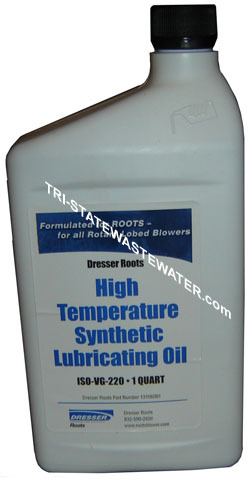 After extensive life testing on rotary lobe blowers, Dresser ROOTS™ introduced a special blend, high-temperature, (polyalphaolefin based) synthetic lubricating oil for ROOTS™ blowers in 1990. High Oxidation Stability - Contains oxidation resistant additives that mean longer oil life and fewer oil changes. ROOTS™ synthetic lubricating oil excels in ASTM oxidation tests, and in the field, where it counts. Longer oil life means lower expenditures, and greater conservation. Excellent Corrosion Protection - Contains synthetic corrosion inhibitors. Protects during operation and acts as a preservative during shut down. Pour Point - from -40°F (-40°C). Flash Point - at 500°F (260°C). ISO Grade Availability - Available in ISO Grade 100, 150, 220, or 320. Container Sizes - Available in one-quart containers, 12-quart cases, one-gallon containers, 5-gallon pails, or 55 gallon drums. Today's ROOTS™ blowers and exhausters are designed and built with the same attention to detail that has firmly established the Dresser ROOTS reputation for reliability, quality and technical excellence over the past 150 years. ROOTS™ synthetic lubricating oils are made with the same quality and technical excellence standards to meet the highest specifications required for maximum performance. See the manual provided with the blower for service intervals of the lubrications mentioned.